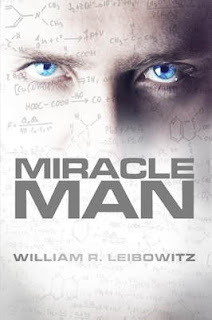 Miracle Man is the first in series of books listed under the categories of mystery, thriller and suspense, but it's much more. For me there is a touch of sci-fi in its "what if" look at the future. What if a super intelligent child grows up to focus selflessly on solving the riddle of illnesses with only treatments and no cures. What if he chooses to give away those cures away in a way that assures even the poorest of people would have access to them. Sounds like something the world would welcome - right? Unfortunately in Miracle Man the answer is no. Robert James Austin - the genius trying to do just that - is plagued by the government men who made his accelerated education possible. They want him to use his intellect to give his country world superiority. Then there is the pharmaceutical industry desperate to halt the new cures as their deep profits rest on treatments that have to be taken for long periods of time at the high prices they set. Cures would mean losing millions of life-long customers. The author warms the story up by winding by bringing in personal notes such as a wonderful mentor and later, a love interest. We also feel the personal toll to Robert's health and mental well-being as he disappears down the rabbit hole when he is fully immersed in new research. Then there is intrigue as we follow the government's dealings, as well as the danger he faces from a contract killer hired by a pharmaceutical czar. But there is also a significant part of this book that follows his research thoughts - first as he is growing up and making new discoveries, and then as he approaches finding a cures. And this part of the book does take a bit of patience. Despite those slower sections, I enjoyed reading this book. And the end, when it comes, will surprise you.